Mount Batur is a beautiful stratovolcano type. This type has a conical shape which is made up of many layers (from sequential outpourings of eruptive materials), characterized by a steep profile, and is the most common type of volcano. Some of which is marked by a collapsed top, called a caldera. 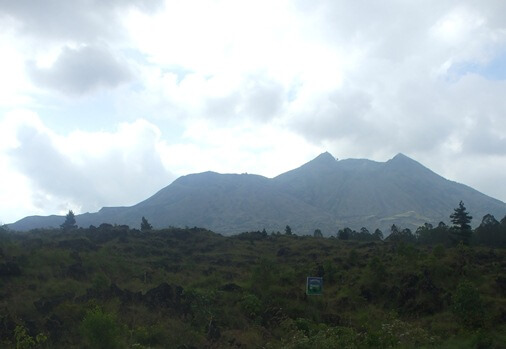 Listed since 1804 AD, Mount Batur has been erupted several times and the last eruption was in 2000 AD. The mountain is an active volcano and currently has a height of approximately 700 meters from the caldera floor (overall height reaches 1,717 meters or 5,633 ft. above sea level). The substantial lava field is visible today and can be viewed from the southwest ridge of the caldera rim.Mount Batur (before the eruption) rose about 3,800 meters above sea level (higher than Mount Agung about 3,142 meters or 10,308 feet above sea level). The eruption that occurred had forced the resident to be relocated along with the main temple of Pura Ulun Danu Batur. Formerly the temple is inside the huge crater, but it has been relocated to the top of the ridge and now offers an impressive view of Mount Batur including the caldera rim. Mount Batur is very sacred and highly respected by the Balinese. One of the concepts of environmental preservation called the "Wana Kertih" (part of "Sad Kertih"). Wana Ketih is a conservation concept of forest including the mountain, in order to create harmony in the universe. This is manifested in the form of physical and spiritual. Physically in the form of protecting forests and mountains (Protected Forest and Nature Reserve). While on spiritually is embodied in the implementation of sacred rituals like "Mulang Pekelem" into the crater of Mount Batur. This ritual is an expression of gratitude or "Yadnya", the holy sacrifice using animals and agricultural products that are equipped with the ceremony (offerings). Mount Batur is also mentioned in some ancient records or lontar included Lontar Kusuma Dewa, Lontar Usana Bali and Lontar Raja Purana Batur. The story told that Ida Bhatara Pasupati was moving the mountaintop of Mahameru. The mountain top is divided into two pieces and each of them is held using both of his hand. The mountaintop on his right hand become the Mount Agung as the stana of Sang Hyang Putra Jaya (Sang Hyang Maha Dewa) and the mountaintop on his left hand become the Mount Batur as the stana of Dewi Danuh or Goddess of The Lake. Dewi Danuh is the shakti of God Vishnu and symbols of prosperity. She is the goddess of the lake water which is rich in minerals, flows inside the cracks and rocks then appear as springs, irrigating the rice terraces to the other rice fields, creating fertility and prosperity. Visitor can enjoy one lifetime experience of mountain trekking to the top of Batur Volcano. Climbing the Mount Batur Volcano will take you around 1.5 or 2 hours. Visitor can see the glorious sunrise, stunning morning views and the cool mountain atmosphere. Also the presence of Lake Batur, Mount Abang, Mount Agung (peeking from behind of Mount Abang) and Terunyan Village (located across Lake Batur). The tour guide usually make offerings at several locations along the climbing route to the summit. This could be one of your considerations to local religious sensitivity before deciding to use a guide or a hike in private. The visitors usually make the climb at pre-dawn and reached the top before the sunrise. Please note, during the rainy season, the climbing track can be very slippery and dangerous. 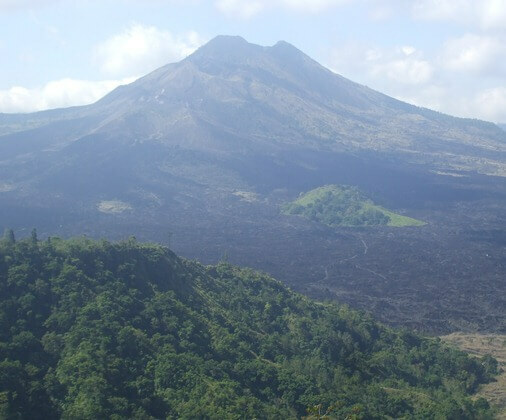 This can be a major consideration of the visitors to make the climb to the summit of Mount Batur. Mount Batur has a crater that still exhaling smoke of sulfur. There is a narrow track at the edge so that visitors can walk around the huge crater. Through the downhill track across the crater, visitors will be arriving at the flat-ground at the slopes of Mount Batur. This place is broad enough to take a rest for a while. Also, there is a lot of small holes with a hot sulfur fumes and often used to cook eggs. Fun of course, but also reminds us of how active the volcanic activity at Mount Batur. Temperature in the area of Mount Batur Volcano is cooler than the plains near the beach. Factors of altitude and fog also coupled with the overcast weather and drizzle are the major cause. During the day are advised to bring or wear a warm cloth (sweater). Jacket is a mandatory equipment to use after sunset. In extreme conditions, the cold temperature would make you shiver, like poking your finger, tingling, smoke breath and teeth chattering (sounds like fun but it would be enough to make you restless and tortured). In this condition, you should immediately warm the body. Hot drinks (like coffee or ginger) and snacks or maybe chocolate bars will be of little help.